One size. The length of the skirt is 70cm (27”). 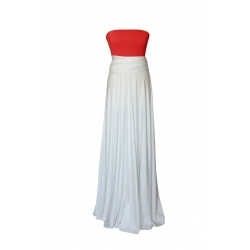 It is made with an exclusive mix of polyester and spandex in an exquisite proportion. Our short convertible dresses are the right pick for a day at the office or for an unforgettable night out... Infinite styles in 1 dress with an amazing fall. Available in 20 magic colors. Wrap it over and over and you will have a new dress!